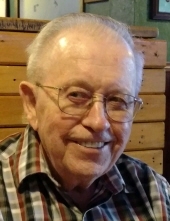 Charles "Charlie" J. Schnitzler, age 91 of Le Sueur, died Monday, October 29, 2018. Memorial service will be 11:00 a.m. on Friday, November 2 at First Lutheran Church in Le Sueur. Rev. Carl Bruihler will officiate. Visitation will be one hour prior to service time at the church on Friday. Interment will be at a later date in Fort Snelling National Cemetery, Minneapolis. Charlie was born on June 11, 1927 to Henry, Jr. and Lillian (Goulet) Schnitzler in Marysland Township, Swift County, MN. He was enlisted in the U.S. Army. He married Gloria Melchert on September 20, 1952 in Appleton, MN. Charlie retired at the age of 57 from working as a Superintendent in road construction. He was an active member in the American Legion and VFW. He enjoyed being with his family and friends, and travelling. He is survived by his children, Cyndie (Jeff) Bass of Minnesota Lake, Jill (Scott) Youngerberg of Spring Hill, TN, Julie (Randy) Tews of Discovery Bay, CA, and Russell Schnitzler of St. Peter; grandchildren, Alyssa (Alex) Minge, Adam Youngerberg, Brianne (David) Smith, Trevor Tews, Sara Engle, Nathen Engle, and Angie Engle; great-grandchildren, Anya and Xander Smith, and Anderson and Asher Minge; and many siblings, nieces, and nephews. He is preceded in death by his parents; and wife, Gloria.